Pressing kefir cheese is really just an extension of the basic kefir cheese. 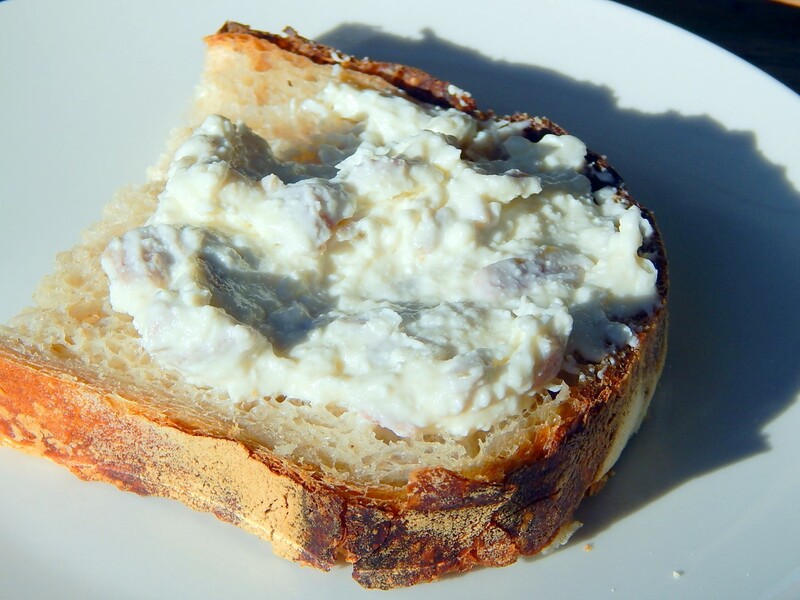 It results in a thick crumbly cheese that is similar to a soft goat cheese in texture. 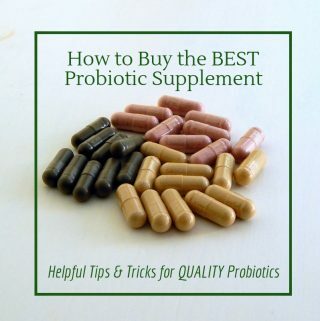 The flavour still has a hint of sourness, but it is much less sour than kefir, as most of the sour whey has been pressed out. 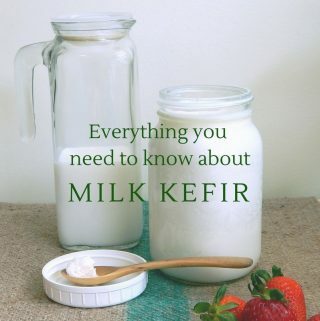 There are two methods for draining most of the whey from the kefir. 1. Strain the kefir through several layers of cheese cloth as in the basic kefir cheese. 2. Sprinkle some salt on your kefir curds (about 1/2 tsp per cup of strained curds). 3. 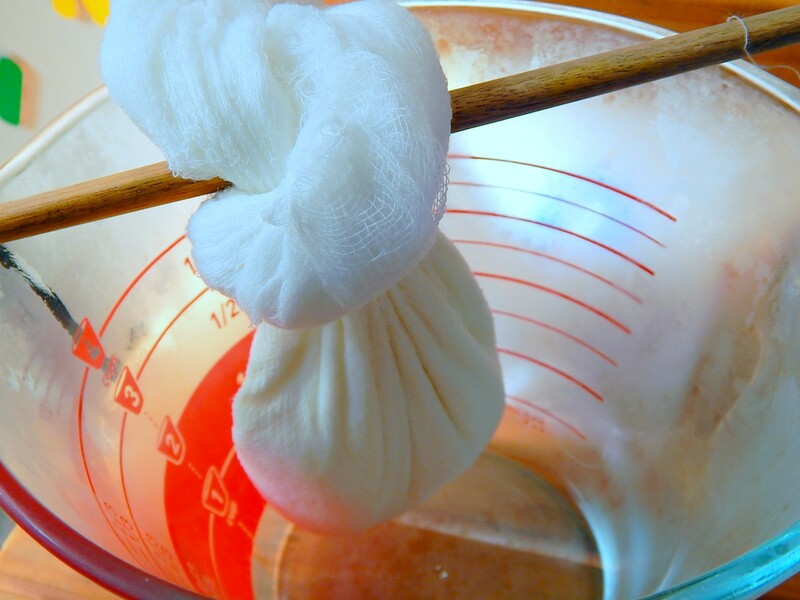 Then hang the kefir ball wrapped up in cheese cloth and leave it to drain for 24 hours. I improvised by tying the cheesecloth to a wooden spoon suspended above a large measuring cup. 3. 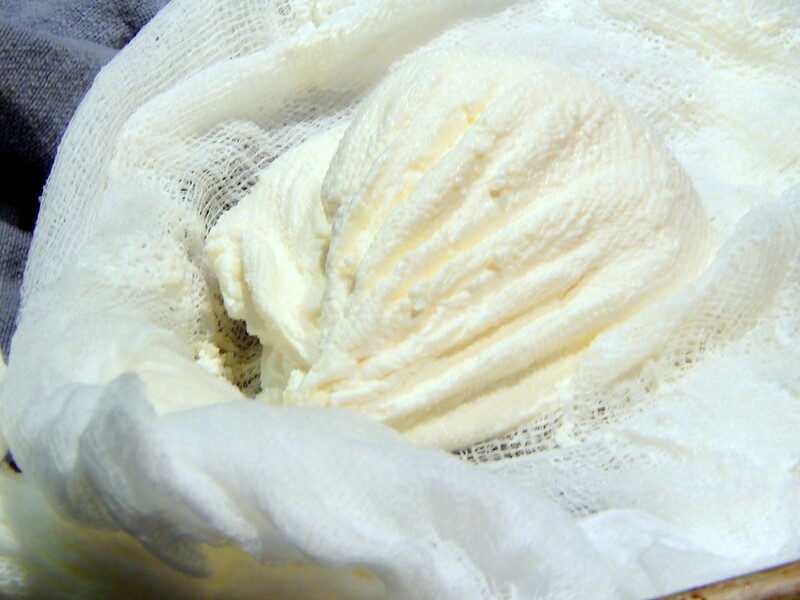 Then wrap the kefir ball in cheese cloth and press it for 24 hours. 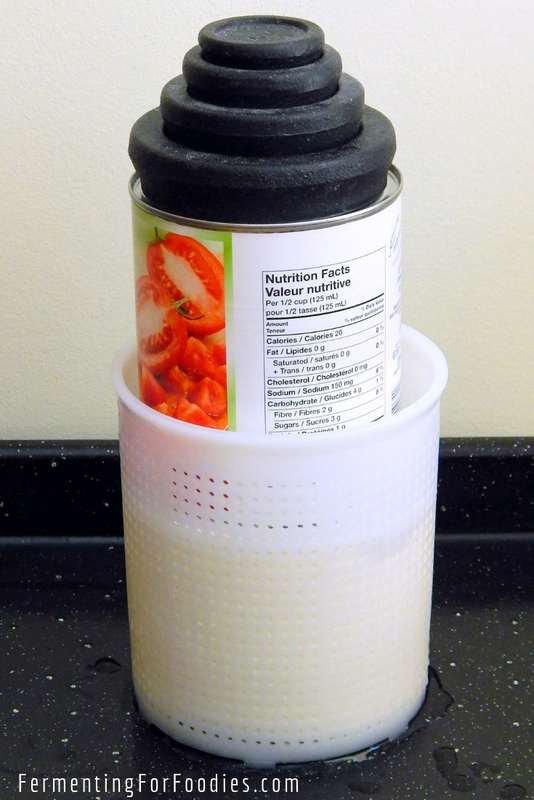 To create a cheese press I cut the lid off a large tin can. I put the cheese into the can, then topped it with the cut off lid (so that the tin lid nested inside the can -see the first picture below). Then I turned the can over so it was sitting on a cup over a bowl (to catch the whey) and put a bunch of weigh on top to make a press. 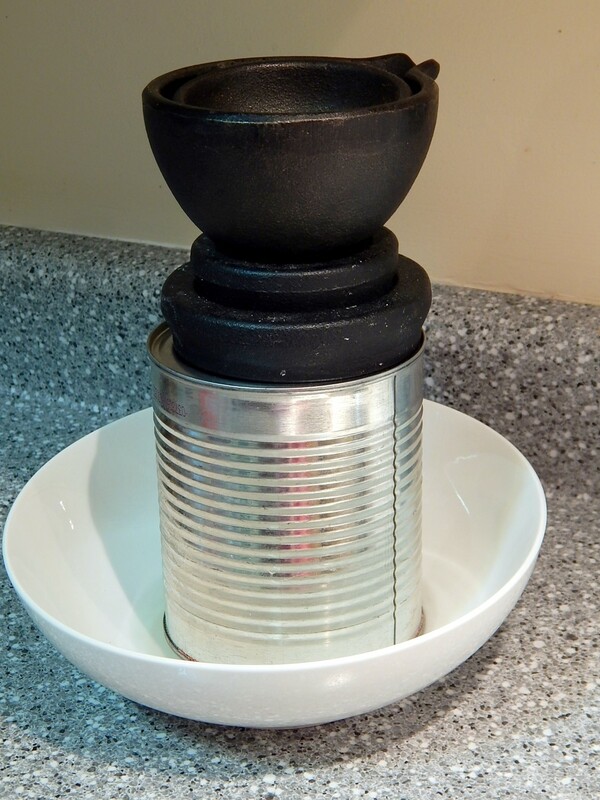 The basic set up (from bottom to top) is bowl, cup, cut lid to the tin can, the wrapped cheese, the tin can, then the weights. (Hopefully the photos will help describe my process, but leave me a message if you need help). 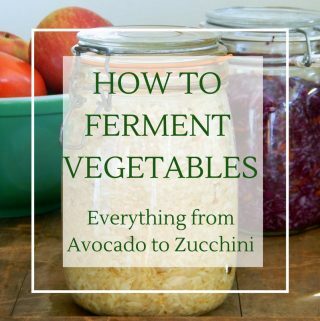 Today is Fermenting for Foodies’ six month anniversary! I still have a ton of things to try to ferment, but if anyone has a request, feel free to leave me a comment or send me a note in Facebook.